Kate wore a familiar pair of sapphire and diamond earrings (likely made from earrings once owned by her late mother-in-law, Diana, Princess of Wales) as well as her wedding and engagement rings, her Cartier watch, and a diamond pendant necklace by Mappin and Webb. 3. Monday's services were held on the date that troops invaded Belgium, and Queen Mathilde of the Belgians was present with her husband, King Philippe, to remember. Her jewelry was sparkling but understated, with a pair of diamond and pearl earrings and a delicate diamond bracelet paired with her dove-gray ensemble. 2. Queen Elizabeth II has already retreated to Balmoral for the rest of the summer, but she still observed the World War I centenary, albeit more quietly. She attended a service at Craithie Kirk, the church near the Balmoral estate. The church is the same one that Queen Victoria attended (and there's a bust of Victoria in the sanctuary), and the Queen's brooch is also a Victorian heirloom: one of her diamond bow brooches. 1. The member of the British royal family who had perhaps the most significant public role during this week's commemorations was the Duchess of Cornwall, who extinguished the oil lamp at the Tomb of the Unknown Warrior during Westminster Abbey's vigil service on Monday. At the vigil, Camilla wore her pearl choker with the diamond clasp, pearl earrings, and her engagement and wedding rings. Instead of a brooch, she wore an item with significant military and personal meaning: the badge of the 12th Lancers, the regiment with which her late father, Major Bruce Shand, fought in World War II. 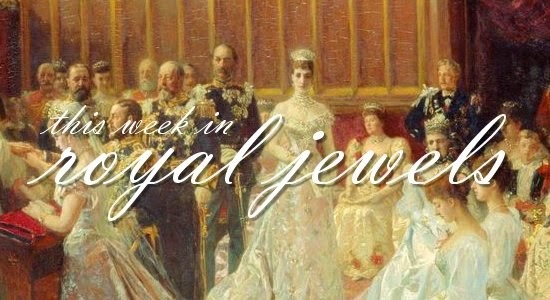 Be sure to catch up with the rest of this week's royal jewel posts!